The information field, or the iField, resorts to interdisciplinary approaches to enrich and facilitate generation, transfer and curation of data, information, and knowledge by the widespread use of technology in order to maximize the potential of humans. The iInstitute at Linnaeus University strives towards fulfilling this vision. Today, the iSchool organisation involves over 80 prestigious universities from around the world. The aim of the iSchools organisation is to promote and practice the iField. Disciplines of the iField include computer science, library and information science, business informatics, knowledge management, business, sociology, psychology, philosophy, ethics, linguistics, media, with a range of applied fields and disciplines such as astronomy, medicine, biology, health, history, religion, archaeology, musicology, literature, art. The need for the iField and the iSchool at Linnaeus University is best described in the following paragraph by Professor Andrew Dillon, Head of iSchool at the University of Austin at the time, Linnaeus University's iSchool project advisor (2017):"
"The most pressing problems of the 21st century are trans-disciplinary and invariably mediated by information or its associated technologies. To lead change, scholarship must cross boundaries and equip the next generation of graduates to think in terms of leveraging human abilities through new IT. There is no single subject or discipline for this, it has to be outside traditional boundaries or it will not work. To do this, an iSchool at your university is essential. Without it, progress will invariably be limited and narrow". Linnaeus University got accepted as a member of the iSchools organisation in December 2017. BAL-ADRIA Summer School on Digital Humanities, Zadar, Croatia, June 16–23, 2019 (keynote: Geoffrey C. Bowker, University of California, Irvine. Seminar by Jean-Francois Blanchette, University of California, Los Angeles, May 18, 2018. Abstract. Video. Inauguration lecture of the iInstitute: Christine Borgman, University of California, Los Angeles, May 7, 2018. Abstract. Linnaeus University accepted as member of prestigious iSchools organisation April 27, 2018 (news item in Swedish). Seminar "Emerging Information Field, iSchools Organisation, and Potential for Linnaeus University". Michael Seadle, Executive Director of iSchools; Dean of Faculty of Arts, Humboldt University and Sam Oh, iCaucus Chair-elect; Head of School, Library & Information Science and Data Science Department, Sungkyunkwan University, featured. The recorded video of the seminar is available at: https://connect.sunet.se/p92gwguambp/. Presentations by Sam Oh & Michael Seadle. November 3, 2017. A Summer School in Digital Humanities, in collaboration with University of Zadar, Uppsala University, iInstitute and Linnaeus University’s Centre for Data Intensive Sciences and Applications. Plans to introduce Digital Humanities as a new subject of study are under way, as well as the Master and Magister programme in Digital Humanities. Our long-term vision is to create a leading education, development and research regional centre in the iField, that combines in novel ways already existing expertise from different Linnaeus University departments and faculties working in close collaboration and co-creation with relevant stakeholders from the surrounding society. Addressing future societal challenges would be possible by highly skilled professionals whose education has been markedly enhanced by practice-informed education and joint, cross-sector innovation. Strategic values to be developed during these efforts refer to uniting and consolidating the expertise we already have to create new constellations for collaboration leading to new knowledge and products (expertise, education, research, public and commercial services relevant for the region, such as a cultural tourism industry perspective), resulting in a return on investment. Plans for the first period (24–36 months) are to focus on the development of new educational programmes and research as outlined in the figures below. 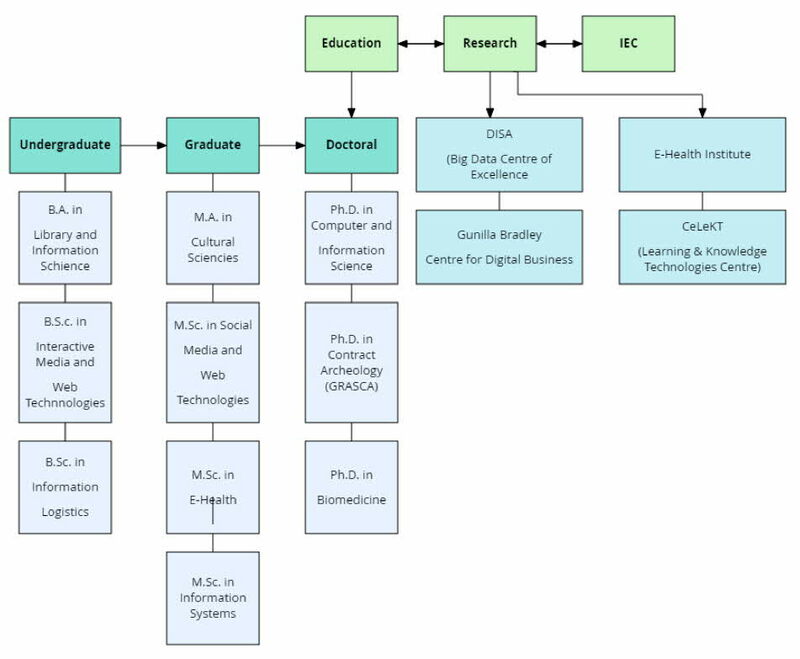 Current research and education nodes affiliated with the iInstitute. 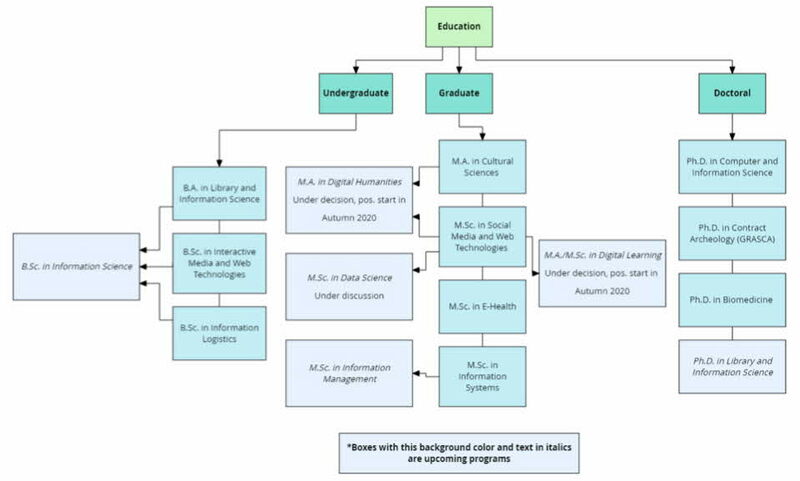 Current and planned programmes affiliated with the iInstitute. "In the information age, every university needs a unit that brings faculty and students together from across the institution to focus on the key knowledge, skills, and issues of information and technology. Welcome, Linnaeus University, to the global community that does just that – to the iSchool community.I think the idea of establishing an information school with those elements is both innovative and very exciting... I think it could help lay the foundation for what an iSchool could also be!" Michael B. Eisenberg, Dean Emeritus and Professor Emeritus, a founder of the iSchools movement. "The most pressing problems of the 21st century are trans-disciplinary and invariably mediated by information or its associated technologies. To lead change, scholarship must cross boundaries and equip the next generation of graduates to think in terms of leveraging human abilities through new IT. There is no single subject or discipline for this, it has to be outside traditional boundaries or it will not work. To do this, an iSchool at your university is essential. Without it, progress will invariably be limited and narrow." "This is an exciting new venture which will place Linnaeus University at the forefront internationally of the burgeoning iSchool movement. Since information occupies a central place in our society – from data science to social media, from library classification to knowledge organization – it is both appropriate and timely that this innovative institute is being created". "I think the idea of establishing an information school with those elements is both innovative and very exciting... I think it could help lay the foundation for what an iSchool could also be!" "...assembling quite a diverse set of units seems to me a novel and potentially very fruitful approach." "I am so glad that you and your colleagues continue with efforts to join the iSchool community. I have been involved with the development of iSchools in the United States from early beginnings as an external follower and even had a privilege to attend their iCaucus meeting in Washington in 2007. There I learned about the importance to discuss the future of LIS education and profession in regards of strengthening the position of LIS departments inside University by opening up and designing new profiles with other, relevant, departments/programs. By all means, to my knowledge, your department managed to attract the attention of other teachers/researchers at your university up to now, and it seems to me that by entering the iSchool family you could gain more strength both in teaching and research area. Having said that, I mean that potentials of cooperation not only between departments at your own University but also with other Universities across Europe and wider, could enable you to submit research proposals, cooperate in PhD education and exchange students and teachers/researchers with other iSchools. I am very glad to learn that Michael Seadle and Sam Oh visited your university and hope that this visit opened up new possibilities for your department, digital humanities and other fields in which LIS could contribute a lot." For more information on the iSchool project, please follow this link!